Active Stylus Digital Pen, which is used on most of capacitive touch devices for taking note, drawing and sketching as real pen, creating the comfortable and ultimate handwriting experience for you!Capacitive stylus pen compatible with most of the capacitive touch screen devices including iPad Pro, iPhones, iPods, Kindles, Samsung Galaxy, Tablets and touch screen laptops. -It is suitable for most touchscreen tablets and phone, and it is better for drawing instead of our fingers. Such as iPad 1/2/3/4, iPad mini 1/2/3/4, iPhone 7,7+,6/6S,6 plus,6S,5/5S, HTC , BlackBerry, Motorola, Android tablet, Samsung tablet, window phone and so on. -It is NOT FIT for iPad Air 2, WINDOWS 8/10 and other window system. 【Smooth Tip】Active Stylus with 1.45mm Copper tip,fast and smooth, Sensitive tip makes the writing experience feel much more natural. 【Efficient Power Management】Rechargeable active stylus powered by built-in battery which can last up to 8 hours. It will power off automaticly after 30 minutes of no use. 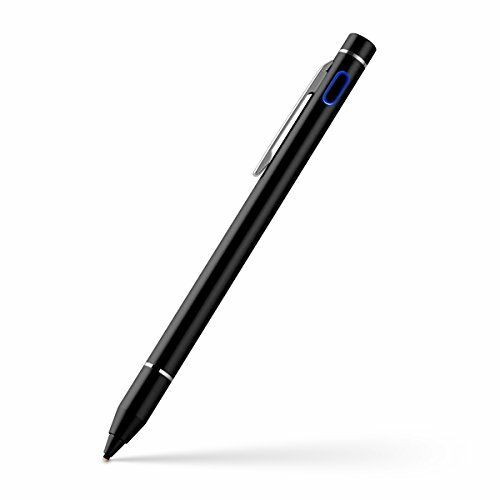 【Active sensing technology】capacitive stylus no additional receiver or a Bluetooth device, just touch stylus to screen. 【Compatibility】Capacitive Pen compatible with most of the capacitive touch screen devices including iPad Pro, iPhones, iPods, Kindles, Samsung Galaxy, Tablets and touch screen laptops.NOTE:NOT compatible with iPad Pro 9.7", iPad Pro 12.9". The stylus does NOT support Palm Rejection. 【Comportable Size & Warranty】Electronic Pen Length: 17.9cm(7 inches), Diameter: 9mm(0.37 inches). Fashion design and aluminum alloy material.One Year Warranty.